Is it snowing in SilverStar ?¡Gracias! SilverStar is a place where memorable holidays happen all year round. The resort offers stunning skiing, thrilling mountain biking, breathtaking scenery, colourful Victorian architecture, wonderful curiosity shops and restaurants, and fantastic people. By day, there's heaps of mountain to explore; by night, there's plenty of après-ski entertainment for little kids, teenagers and the young at heart. 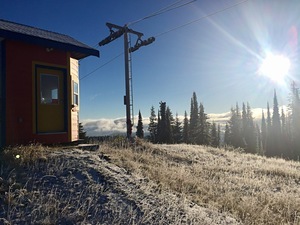 Blanketed annually by seven metres (23 feet) of dry, feather-light champagne powder, SilverStar is the third largest ski area in BC. With four distinct faces and 132 runs, bowls and gladed areas, there is something for every level of skier. 105 kilometres of world-class Nordic trails weave through the mountainside, offering the largest daily groomed cross-country trail system in Canada. You don't always have to agree on fun to have fun at SilverStar, with their My1Pass you get access to 7 different activities; from skiing to snowboarding, Fat Biking to snowshoeing and skating to Nordic, there's so much to do! SilverStar Mountain Resort is incredibly easy to get to; less than an hour's shuttle from the Kelowna International Airport, which offers non‐stop direct service from many Canadian and international cities. In March we spent 2 weeks skiing in Silver Star and it was amazing! The resort is very small compared to European resorts or larger N. American resorts such as Whistler or Vail. It is located in the Okanagen region, an hours drive from Kelowna Airport or 5 hours drive from Vancouver. In fact, it has just 5 chair lifts but the variety of runs off each lift was impressive. On the frontside of the mountain there were ample greens and blue runs for you to cruise around on and perfectly suited to beginners and intermediates. In the Silverwoods area it is all about tree skiing with wide open gladed areas and also some tighter trees for those who like to turn quickly between them. On the backside is where the fun happens with lots of blacks and double blacks for any level of skier to be challenged. And the snow that covers the runs is superb: light, fluffy powder that falls from the sky regularly. The village, like the resort, is small but perfectly formed. All the buildings are painted bright colours and it has a very romantic charm. Accommodation can be found to suit all budgets but we managed to find an absolute bargain condo on ownerdirect.com. The condo, like almost all others in the resort, was ski in/ski out which is brilliant; modern furnishings and had it’s own hot tub! We booked the kids in to ski school for morning lessons for a week and ourselves in for two morning lessons.The kids had the best time with them actually asking to go back for the afternoons! The instructors had a great rapport with the children and were very patient and understanding. They made the lessons fun while teaching them some great skills and technique and we saw their skiing improve leaps and bounds. Our instructor was also great. As we are advanced skiers we just wanted a few tips to tidy up our skills and we had certainly got that, we even got filmed and had an opportunity to watch it back with the instructor which really helps to see what we were doing wrong. 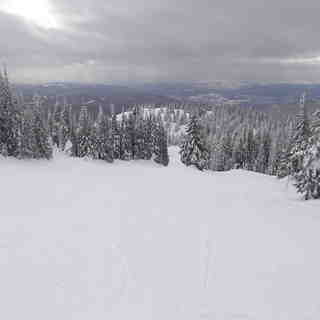 I would return to Silver Star for the ski school alone! Seriously, can’t recommend it enough! There is a good variety of dining options and bars/pubs but no nightclubs as the resort is much more suited to families. Our favourite apres stop was Long Johns, where a pitcher of beer will only set you back $12 and a huge burger with the best sweet potato fries for another $15. We also loved The Den which is a bistro style restaurant and bar with main courses around $25 and drinks are very reasonably priced with again a pitcher costing only $12. If you want to cook for yourself or get bored of the on-mountain offerings the large town of Vernon is a 20 minute drive down the mountain. The lift pass is called the ‘My One Pass’ as all for the same price you get access to the ski lifts, nordic trails, tubing and ice skating! They have really positioned themselves as a fantastic family resort and also have a climbing wall and a bowling alley. Next year we are definitely going back. 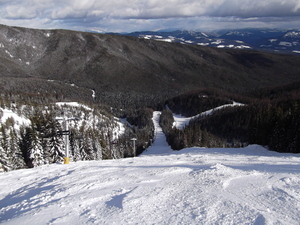 There is enough at Silver Star to keep you entertained for at least a week and you could combine your trip with other nearby resorts such as Big White (about 1.5 hours drive away), Revelstoke (2 hrs) and Sun Peaks (2.5 hrs).